So, here is the first one I threw together. Still not one of my favorites but it works. 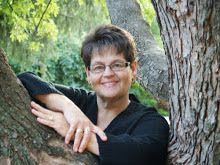 If you put together a card and would like to share it I would love to post it on my blog. Just email me and we will share together. Have a great day!! Here is our Weekly Deal Sale at Stampin up! check it out. Just click on the link and you'll go directly to my website to order and it will come directly to you! Don't forget the Holiday Sale is still going on too! ﻿Just wanted to send out a little reminder about our sale at Stampin UP. It goes until December 2, but don't wait until the last minute as you could miss out on the big discounts! Remember you can go to my website here to see what's on sale and order http://www.stampinup.com/ECWeb/ItemList.aspx?categoryid=1680. One of the great things for me was that they are even offering discounts on my favorite BUNDLES!!! If you have any problems putting in your order on line, I'm happy to give you a hand. LOOK at What Diane and I DID! My dear friend, Diane, got her new Tim Holtz Snowman die and wanted to use it right away! We got together in the studio and this is what we came up with. TOO stink in' cute don't' you think? This is a card for one of my future Stamp A Stack classes. I used the Papillon Potpourri http://www.stampinup.com/ECWeb/ProductDetails.aspx?productID=132058 and A Dozen Thoughts http://www.stampinup.com/ECWeb/ProductDetails.aspx?productID=131059 stamp sets from Stampin Up. I also used the butterfly punch http://www.stampinup.com/ECWeb/ProductDetails.aspx?productID=129406 to punch out the little butterflies. I just love when we have a punch to cut out our stamped images, so much quicker than "fussy-cutting"
My new 2014 classes are listed on the right of the blog, check them out and sign up soon. I'm hoping to fill them up quickly! I received the new 2014 SU catalog WOW! some really cute stuff in there and the next BIG DEAL! at Stampin UP is coming soon… SALE-A-BRATION!! More details to follow soon!! I just wanted to share another snowman card. I have all my Christmas cards completed YIPPEE!! I used my Tim Holtz snowman die, a mover a shapers for the Hope, Acucut die for the card base and of course my Stamp Up "Merry Christmas" Hope you're having a great day! Well, I wanted to share what I've been working on the past few days. Figuring out how to store all those Bigz dies and the Fiskars punches. I think I have it. I got the shelves from Ikea and the wire rack is an up-cycle my storage hallway. Well that's it for today. Other Goodies on Sale this week! ﻿Here are a few more details about the sale! and I didn't want you to miss the weekly deals!! You can go to my website to order all of these . www.createwithbubbe.stampinup.net Have fun!! Thanks to all! The 24-hour sales period on these three products ends at 11:50 PM (MT), November 20. Discounts range between 20 and 50 percent! There's no minimum purchase required to participate in this promotion. For product bundles, you need to use the bundle item numbers provided. If you use individual item numbers, you won't get the discount. Go Here to See What's on Sale! You can click here to see the flyer that shows what is on sale! Have fun!!! The 30% Off 24- Hour Sale NOVEMBER 20 ONLY!!! You must order before midnight to get this 24 hour special. Make sure to check out the long list of other sale items tomorrow!! You want Christmas goodies to arrive in time for Christmas. I finally got around to using my TH snowman stamp. I have the tiny ones that were an exclusive at Archivers last year, this is the larger one. I just love snowmen can you tell. I'm going to send this one to my friend _____ can't say she watches my blog LOL Have a great day. Oh I only have a few more snowman cards to share. I reorganized my studio with a new storage idea for my big xl dies and my fiskar punches I'll share later on this week. have a great Monday! Sorry! Been off the grid for a couple of days. Getting ready for winter and cleaning out my studio. Oh my! I have so much stuff to get rid of: stamps, paper, embossing folders and who knows what's in that box!! So, I'm going to have a Spring Cleaning sale in the spring. I'll let you know when I've got it all together. Now, about this card I used the Tim Holtz die and Cuttlebug embossing folder to create this little card. Well, off to sort through the drawers. Have a great weekend. Yeap! another Snowman Christmas Card. Did I mention I LOVE snowmen? Using Tim Holtz snowman die and an old Cuttlebug snowflake folder. I never get tired of creating cards using all my cool stuff. I'm soooo blessed! 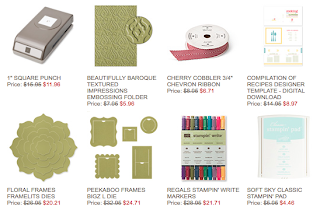 WEEKLY DEALS AT STAMPIN UP!!! Hey everyone you just might want to hop over to my SU website and see what our weekly deals are. Just click http://www.stampinup.com/ECWeb/ItemList.aspx?categoryid=1634 and this will take you directly to my SU website make your choices and the goodies will come right to your door step. Have a great day! Good Morning! Just a quick card to share that I designed for Cropstop. I used Heartfelt Creation stamps, Spellbinders dies, and Cuttlebug embossing folder. I also used a Sizzix leaf die and Memento ink. I love that I can use all my different supplies to create. Have a great day! Just wanted to share a card I made using a Heartfelt Creations stamp and the SU Real Red ink. I used an old snowflake Cuttlebug folder on the background. Oh yeah, the ribbon was from the discount bin at HL. Hope you're having a great day! I love using all my goodies, don't you? I got the new Tim Holtz Snowman die this weekend at Michaels. They were on sale 30% off and I had a 25% off your total purchase WHAT A DEAL!! Of course, I had to get some others, I share what I do with those later. 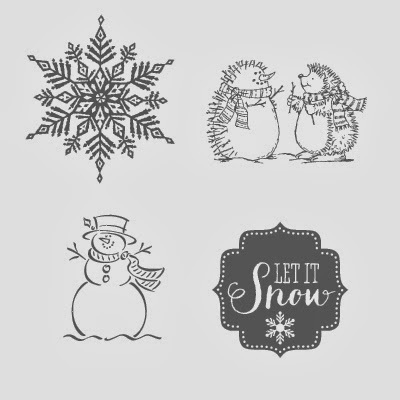 I pulled an old Cuttlebug snowflake embossing folder out, SU white ink, and the little tag was stamped with the new tag set from SU http://www.stampinup.com/ECWeb/ProductDetails.aspx?productID=135290. I bought the bundle and I was very impressed with it. You can make 70 tags and you have the photopolymer stamp sets for the future. Make sure to check out the my upcoming classes I hoping they fill fast. I already have all the cards designed and I'm going to start putting together the kits soon. Have a great Monday. Here's the card my sister, Rose, and I came up with last night. We used the Tim Holtz snowman die from last year, the mover and shapers die "wish" in his belly and one of the Sizzix snowflake embossing folders. We spent several hours last night making different snowman cards. I'll share others throughout the week. Have a blessed Sunday! Just got this set of stamps and I think I'm going to really like it. They are small enough to use on gift tags as well as cards. Hope you have a great day. This is just another example of using the SU bow die cut. I used DCWV paper and the circles have a glitter on them. Now, I had a problem getting the tape to stick on this one. As I mentioned in the earlier video you would have to use the orange line tape to make this hold. I also used the Itty Bitty Banners stamp and die for the sentiment. Hope you're having a great week! Tonight is my November Stamp A Stack class, it's a full class I'm so excited! I've posted the upcoming 2014 classes take a look and check your calendars to see if you can join us. This is one that I used the Gorgeous Grunge set (click here to order) http://www.stampinup.com/ECWeb/ProductDetails.aspx?productID=130517 and the Endless Celebrations set. LOVE the grunge set. Have a great day! Here is a close up of the card made with the Endless Celebrations set. It's cased from the Stampin Up site, I just thought a close up would be nice. Have a great day! Just a quick card using some of my stash. I cut this snowman out last year and never used it. It's the old Sizzix die cut. The background the the greeting is from the Endless Celebrations stamp set. I've got a video to post tomorrow make sure to check back. This is the newest set. Check it out! Here is another quick video for you. Hope you enjoy it. I've been in the studio a lot lately making up lots of cards with all my new stamp sets from Stampin Up. Have a great day! Here's another "boot" card. With all the rain we had last night I thought this was appropriate. Have a great Friday! Bootiful Occasions # 126597 click here to order. I used a card is from a box I got at Michaels. The background stamp was a Hero Art, the "greeting" is from Stampin Up as well as the burlap ribbon, Baked Brown Sugar ink and button. I like to show that we can use a variety of products to come up with a great creation. Have a great day!